Dougal came for a stay last Thursday. Being flat out for much of last week we didn’t get out much but I did manage to get them both to the Wetlands for a walk. Still no rain to speak of so there is no change in the water levels. It might not seem like that from the photograph, but then looks can be deceiving , however, the main pond still has water in it. Still it was a good time together and if he is still here, I will take them both for a drive out to the Lighthouse at the weekend. At the end of this month we may be looking after a new dog for two weeks. One of the ladies at the church asked me if I would be willing to look after her dog for two weeks . Annabell was there at the time and she said we would love to. I totally agree since the lady in question is one of the coffee ladies group and she has a Pug called Max – that should be fun. 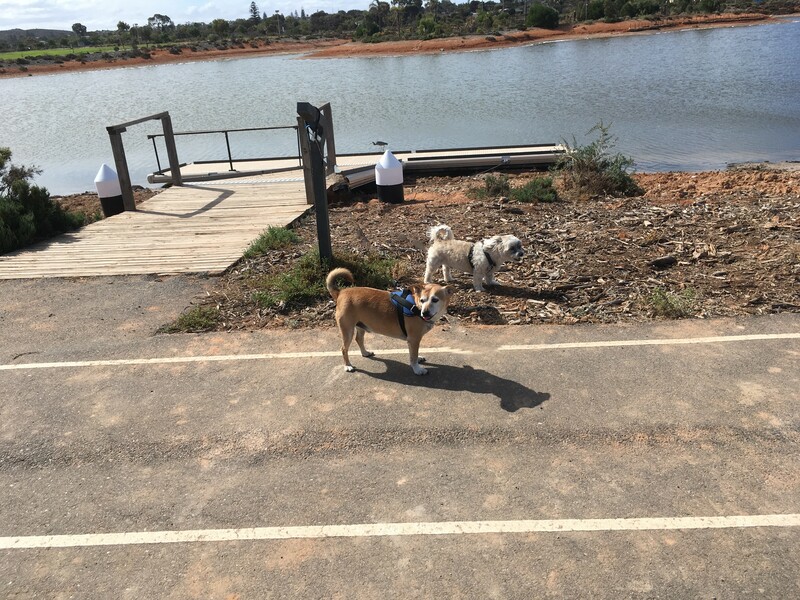 This was at Port Wakefield , I believe. Wont look at the Camera. In the far north of the State, things are different and the desert is blooming again. The flood waters from Queensland have made their way down and are currently pouring into Lake Eyre – normally dry. As the waters have made their way down from Queensland and filled the dry river beds, the desert is now watered , everything along the way is blooming and there is an abundance of wildlife, swans, ducks, wild geese and pelicans. The water will create islands in the lake where the birds can breed and raise chicks without foxes and dingos being able to get to them. Lake Eyre is 9,500 square klms however the Lake Eyre Basin and catchment area is 1.14 million square klms. It’s a big, big basin and lake Eyre itself is some 15 meters – about 50 feet – below sea level. Last time it flooded my son, John, took the flight up there and flew over Lake Eyre and the surrounding area. I did see the photographs and it was quite a spectacular sight to see the water flooding into the lake. I took the dogs to the lighthouse and we had a good wander around the place and a good long walk around the point. The weather was nice – bit on the warm side (34c) but quite nice. Benji did his usual and refused to look at the camera. The drive to and from the lighthouse is 76 klms. or 46.25 miles, so it’s not something I do too often but there’s no where else we can go – everything else around us is either a conservation area, or a reserve area and the whole of the Flinders Ranges are National Parks. One of the things I enjoy doing is taking photographs. I agree I’m not all that good at it but I like doing it. I did go to a photography club some years ago , but wasn’t too impressed with it. I am thinking I might give it another go. It seems to have a different attitude to it these days so perhaps I might not find it quite as I did last time. One can but try. But then I have also changed since then and and I do believe I have quite mastered the Box Brownie now. Unfortunately the dust is really the topsoil from the dry and parched farms in the south east of South Australia – it’s in essence the topsoil from the farms. 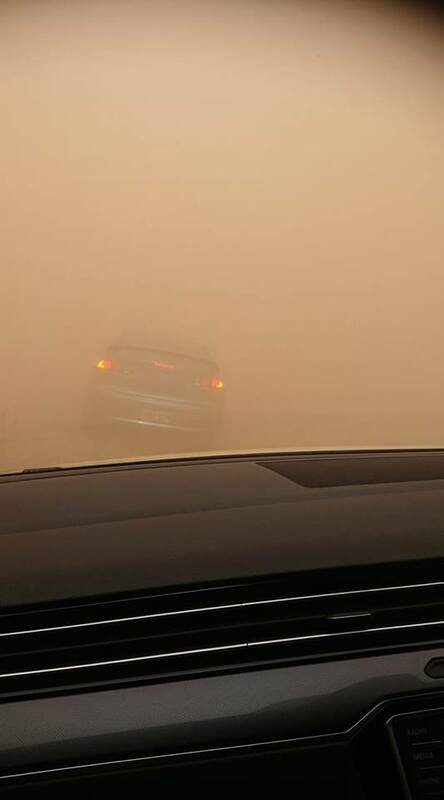 Holy cow…that dust storm photo is terrifying to think there were vehicles driving in it! We had another blizzard yesterday and driving in low visibility is not something to mess around with. Yikes. Sweet Benji…he just wants to have fun with his buddy Dougal. Enjoy your pet sitting venture with the Pug. Sounds like fun times ahead. I think most people drove sensibly since there were no reports of any accidents – which was good. Yeees, I am starting to think that this time Dougal might just outstayed his welcome and we don’t think Benji is too happy They get along well enough, but there’s something there… . Dougal has been here for 16 days now and there has been two spats already.. Have no idea what is happening – Ina is still in hospital and Sam is still down in Adelaide. There is talk with the ladies that Ina might not be well enough to come back home for quite some time. We will not take Max if Dougal is still here – and I think he might be.. Whoa!! That dust storm looks scary! Kinda like driving through a hail storm, but not as noisy. I remember having to drive part of the way home from Ducky’s daycare – with her in the car – one afternoon a few years ago. Luckily, we were on our own road (about a mile from home) when it started, so we didn’t have far to go; but it frightened poor Ducky half out of her mind. And I wasn’t too happy with it either. Thankfully, the people on the road with me all drove responsibly and we all made it safely up the road to our destinations. Sounds like you have some fun times lined up with Max around. I have not been in that kind of dust storm but Annabell and I were caught in a serious thunderstorm once and that was scary. Visibility was almost zero but I was able to pull off the road until it passed. Fortunately we were on a quiet area of the road but I have to say that the noise was something else..
You have quite a rota of doggy visitors! That dust storm is terrifying. Fortunately everyone seemed to have driven to the conditions and there were no reports of any accidents. Never been in a serious dust storm since this is not really a farming area and the only “mini -dust storms” we get are from the empty land beyond the fence lines. I have, however, been caught in a serious rain storm whilst driving and that was scary enough. Couldn’t see a thing so we pulled off the road and waited until it passed. If Dougal is still here we wont take Max, so we wait and see.